Posted September 8, 2017 by Amy Kawa & filed under Uncategorized. Mortimer Brewster is living a happy life: he has a steady job at a prominent New York newspaper, he’s just become engaged, and he gets to visit his sweet spinster aunts to announce the engagement. Mortimer always knew that his family had a bit of a mad gene -- his brother believes himself to be Teddy Roosevelt and his great-grandfather used to scalp Indians for pleasure -- but his world is turned upside down when he realizes that his dear aunts have been poisoning lonely old men for years! When Mortimer’s maniacal brother, Jonathan. (who strangely now resembles Boris Karloff) returns on the night that the aunts were planning to bury the newest victim, Mortimer must rally to help his aunts and protect his fiancé -- all while trying to keep his own sanity. as well. 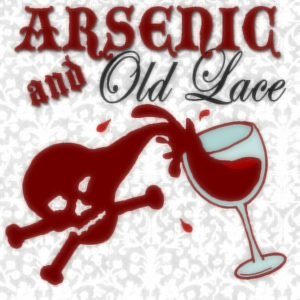 An uproarious farce on plays involving murder, Arsenic and Old Lace has become a favorite amongst regional theaters throughout America. Auditions will be held in The Gus after school on Thursday, September 14, with callbacks the following day, Friday, September 15. We can't wait for what will surely be another amazing performance in from the Performing Arts Department!